Pottery Avenue wants your breakfast table to look graceful for the morning buffet or just because you can! This Handmade Fancy Rim Covered Butter dish is a two piece set. Pottery Avenue wants your breakfast table to look graceful for the morning buffet or just because you can! 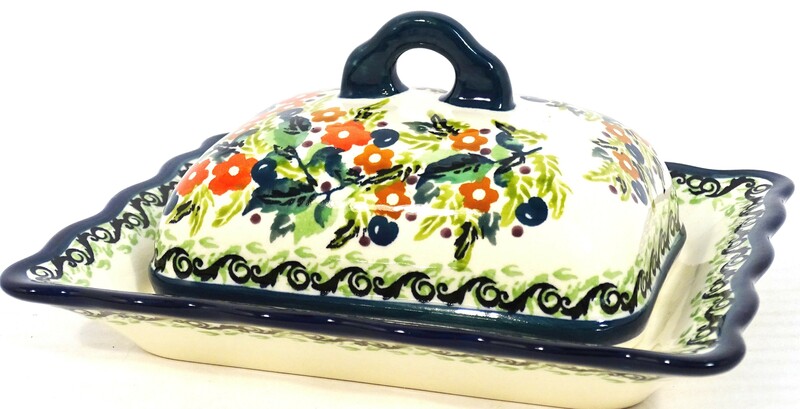 This Handmade Fancy Rim Covered Butter dish is a two piece set. “Boleslawiec” Stoneware features a food-safe construction, crafted with lead-free paints with an eye-catching design. A rectangular plate with scalloped edges holds a handled curved, rectangular top that keeps the butter covered until usage. This beautiful piece will make a great addition to any cutlery collection. • Stoneware must be room temperature prior to use in a microwave. • To insure longevity of your stoneware, it is recommended not to put the piece too close to a heat source. A national treasure, Boleslawiec ceramics have been manufactured for centuries. Developed from natural ceramic clay that can be found near Boleslawiec at the Bobr and Kwisa rivers. According to historical sources, the first stoneware was made in medieval times and in the early 16th century, local potters formed guilds to ensure perfection. Zaklady Ceramiczne "BOLESLAWIEC" was founded by one of the original men with the first pattern dating back to 1759. "SEASONS Covered Butter Dish" is a UNIKAT pattern based of the 300 year old pattern "EYE OF THE PEACOCK". Designed by top designer and imported by Pottery Avenue, the premier importer of Polish Pottery & Polish Stoneware.